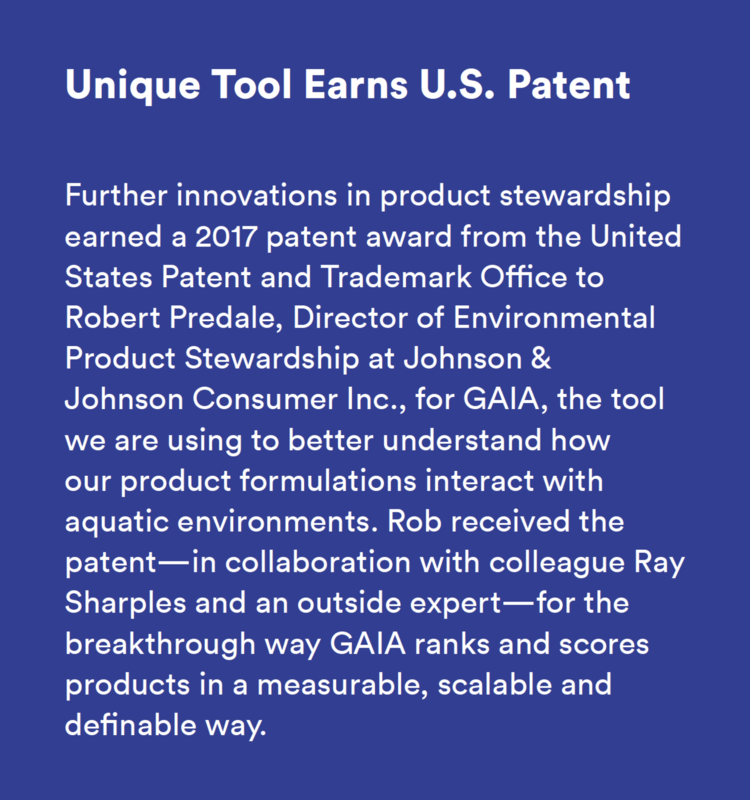 We have developed two proprietary science-based product stewardship tools to help guide our product lifecycle impact assessments: GAIA Protocol and EARTHWARDS. The Global Aquatic Ingredient Assessment (GAIA) Tool was developed to measure the potential "end-of-life" environmental impact of ingredients in new formulations. We use the GAIA tool to evaluate the biodegradability, persistence, bioaccumulation and toxicity of formulations on a scale from 0 to 100, with scores over 80 indicating a formula is environmentally preferred with little or no environmental hazard. EARTHWARDS has served as an approach we have been using to integrate sustainability across our diverse product portfolio since 2009. Our cross-functional project teams use the EARTHWARDS approach to identify and quantify improvement opportunities across seven key sustainability impact areas: materials, packaging, energy, waste, water, social impact and innovation. Opportunities to drive improvement from formulation and manufacturing to product use and end of life are considered. By focusing on the lifecycle areas with the highest potential impact, we can prioritize improvements for the largest possible effect. When a product achieves at least three significant improvements across our seven impact areas, a board of external experts determines if it warrants EARTHWARDS recognition. Adherence with our EARTHWARDS approach is assessed and audited annually by an external verification firm. For more information on recognition methodology, visit this page. Since we launched EARTHWARDS in 2009, 118 products have been recognized, with 24 newly recognized in 2017. As part of our Health for Humanity 2020 Goals framework, we set a goal to fully integrate sustainable design solutions into our product innovation processes. To help measure progress against this goal, we have a target to increase the percentage of revenue from EARTHWARDS-recognized products. Fully integrate sustainable design solutions into our product innovation processes. New and existing products representing 20% of Johnson & Johnson revenue achieved EARTHWARDS recognition for sustainable innovation improvements. * Percentage not inclusive of products newly recognized in 2017. To brainstorm ideas and spur innovation across our global product stewardship teams, we organize EARTHWARDS Innovation sessions. These are workshops where we use a suite of tools and resources to have our cross-functional teams think about their products from a sustainability perspective and identify areas of improvement. In 2017, we held 29 sessions resulting in 9 EARTHWARDS recognitions, with several others added to our EARTHWARDS recognition pipeline for 2018 and beyond. Sustainable design innovations earned ACUVUE OASYS 1-DAY Contact Lenses both EARTHWARDS recognition and an Environmental Leader award in 2017 for achievements in packaging, energy, and waste and recycling. From a packaging perspective, we reduced paper-based secondary packaging by 60%. We were also able to reduce energy consumption in our manufacturing process by 12%. Finally, 100% of the paperboard cartons are sourced from responsibly managed forests. SYMTUZA (darunavir/cobicistat/emtricitabine/tenofovir alafenamide [D/C/F/TAF]), a once-daily darunavir-based single-tablet regimen (STR) for HIV, is another highlight from 2017. This medicine combines four active pharmaceutical ingredients into one tablet, not only providing therapeutic benefits, but also resulting in a more sustainable product. In fact, each bottle of SYMTUZA is replacing four bottles of individual medicine, each of which contains only one of the four active ingredients. This improvement has resulted in a 27% raw material reduction in drug product manufacturing and a 72% primary packaging reduction; furthermore, 60% less water is needed to clean the equipment in the drug product manufacturing process. In our Consumer business, NEUTROGENA Hydro Boost Water Gel with SPF also received an EARTHWARDS recognition for achieving a 17% reduction in raw material use, a 27% reduction in energy required for manufacturing, and removal of parabens as an ingredient. * Savings are for products recognized through the end of 2016 and are estimated based on best available methodologies for each impact reduction area; select products are not included in savings estimation because of lack of detailed data; we track savings starting the first full calendar year after a product is recognized. 38 Each EARTHWARDS recognition is as compared to the previous version of the product. 39 PROXISURE Suturing Device IFU.